General. 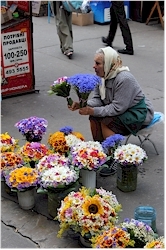 Kiev is Ukraine's capital and the country's largest city and also the symbol of the nation's independence. When talking about Kiev, many people think about the orange revolution or the Maydan revolution (Euromaidan) but they should also think about the many shiny golden domes that decorate the city's churches, the Lavra monastery which is Unesco heritage, the city's rich history, the mighty Dnipro river and all the other sights it has to show for. During it's turbulent history, the city had to endure many sieges and destructions, but it bounced back each time as the phoenix that rises from its ashes. 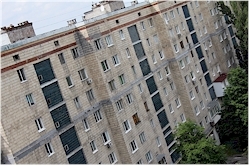 The result of the devastations during the Second World War and the Moskou-based ruled at the time of the USSR is that the city has no intact center anymore but is rather a melting pot of many different architectural styles. You love it or you hate it but it cannot be denied that it is a very lively and interesting city. Brief history. According to a legend, the city was founded by three brothers (Kyi, Scheck and Khoryv) and their sister (Lybed), and named after the oldest of the brothers. A monument has been erected on the banks of the river to commemorate that legend. Recently Lybed, had a metro station named after her. Initially, Kiev was a modest Slavic settlement based on the banks of the Dnipro river and on the important trade route between Scandinavia and Constantinople. 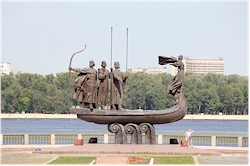 In the 9th century Vikings took control of the area which was the beginning of Kiev's golden era, resulting in what became Kyivan Rus ("the big state of Kiev"), thriving on trade between north and south. At the end of the 10th century, the city became the center of Orthodox Christianity. Prosperity ended with the invasion of the Mongols in 1240, who destructed the city. From that moment on till the end of the 19th century, Kiev's importance became minimal and the country was conquered several times by foreign nations. After various conflicts and treaties, it changed hands between Luthuania, Poland, Russia,... Only with the industrialization in the 19th century, the city gained again more importance and became the third biggest city in the Russian empire after Moscow and Saint-Petersburg. In 1941, the city was captured by the German army and recaptured by the Red Army in November 1943, a very destructive period for the city and the whole country. Only in 1991, with the collapse of the Soviet Union, Ukraine became independent. With the orange revolution in 2004 and later on with Euromaidan, Kiev was the center of mass political protest. 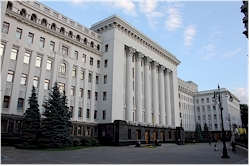 Kiev's areas to visit. The city is divided in several districts. The most interesting to visit are Lypky,the Lavra area and Podil. 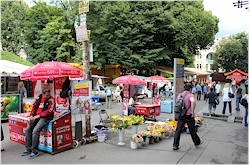 Lypky is the real city center, here you can find Indepence Square (Maydan Nezalezhnosti) that became famous by the Orange Revolution protests and Euromaidan, Saint-Sophia's cathedral and Saint-Volodomyr's cathedral. 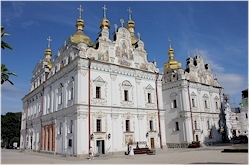 The Pecherska-Lavra area is a beautiful area with the Lavra cave monastery as one of the major attractions of the city. Next to the monastery, you cannot miss Rodina Mat, indicating the spot of the Museum of the Second World War. 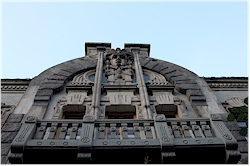 Podil, is the most authentic part of the city with the most touristic street Andriyivsky usviz, several museums (amongst them the infamous Chernobyl museum) and the magnificent Saint-Andrew's church. 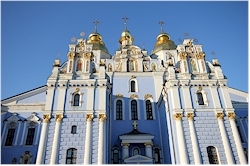 At the edge between Podil and Lypsky you can admire the blue and gold domed Saint-Michael's monastery.